Isabella just received the first dose of chemotherapy at 5:10 PM. One of the medications was a straight push through the port, and the other is a 4 hour drip that will finish shortly after 9 PM. Then at 8 or so, a third medication will be given orally. We will do the same thing tomorrow night, then hopefully, go back to rehab at Rusk on Monday. Here's an inspirational scene from Lord of the Rings and hope that the remaining tumor cells are treated how the orcs are treated. We just got transferred back to the Pediatric Unit, so we will be starting soon. Julianne and I have no idea what to expect. How much nausea will Isabella have? If and when will her hair fall out? The nurse says that everyone reacts differently so we'll just have to wait and see. More in a bit. After further analysis by the neuro-pathologist at St. Jude, he came to the same conclusion as the NYU neuro-pathologist and they completely agree that it is a malignant glioma. We are not even going to bother waiting for the Johns Hopkins pathology results. Isabella is scheduled to begin chemotherapy immediately, tomorrow, Saturday, December 13. Isabella also had another MRI today and it showed that her brain stem is shifting back to normal (remember that it had been shifted by the original tumor). More importantly, it showed that the remaining tumor cells left in the stem were not growing at any noticeable rate. This is probably one of the first pieces of "good" news we've received since they removed the tumor. If the remaining cells had been growing at a fast rate, it would be a much poorer prognosis. We're a little disappointed because the rehab doctor said Isabella was doing so well, that he was going to let us take her home on a "day-pass" on Sunday. Since she'll be doing chemo on Saturday and Sunday, she won't be able to go home now. But we are mostly relieved that we definitely now know what we are dealing with and know how we are going to treat it. We will still have many anxious moments over the next several months as we see how the remaining tumor cells react to the chemotherapy. I am like a human emotional rollercoaster. You should see me – over the last three weeks, my emotions have changed like the wind. It is so overwhelming to see my child in distress. I was terrified when Isabella became unresponsive when we first got to NYU. I was relieved to see her wake up from surgery to remove the tumor and speak. (They told us there was a chance that she would not be able to speak.) I was devastated when we found out the tumor was malignant and had spread to an unresectable area in the brainstem. I now feel a little bit better that there is a chance for cure with the Head Start protocol. My emotions vary by the day, sometimes by the hour. Here is just a quick example of how my mood changes. Maya Manley, the founder of the Making Headway Foundation and a frequent volunteer visitor, came to see me one day in Isabella’s rehab. I was in tears as I told her Isabella’s story. She suggested I talk to one of their therapists. I got a call a couple of days later from the therapist. At the time, Santa had just visited Isabella and given her that precious computer which cheered her up so much. Also, the oncologist had just told me a story of a Connecticut child who had a similar cancer who participated in the protocol and is still recurrence-free 4 years later. So when I spoke to the therapist, I told her I was doing pretty well and didn’t need any help. Two days later, after sitting with Isabella for 48 hours, watching her lay in bed refusing to cooperate or interact with anyone, I was a mess again. Maya happened to stop by our room, and it was pretty obvious to her what a wreck I was. After going home, and having a break, I returned to see Isabella happily back in rehab. Of course, when the therapist came by to see me, I was doing fine and again told her I didn’t need any help. Maya and the therapist must think they’re each talking to two different people! I told Julianne it is very cathartic to write things down and is very helpful as one of the ways to deal with this tragic event. It really is inspiring and comforting to know how so many people follow the blog and are genuinely interested. Several people have told me that they follow the blog every day. I convinced Julianne to try her hand at writing and she will be contributing to the blog to provide her perspective on everything going on. Up till now, what you have read on the events is based on my interpretation. I think it will be very interesting for everyone to read another point of view. While Isabella was in the Pediatric Unit, Santa Clause made a surprise early visit to the kids. This was one of the few times that Isabella perked up while there, and who wouldn't if they were being given all sorts of gifts? Isabella got a bunch of gifts, but her favorite is a toy laptop that she got (wow, just like daddy!). It plays games and music. The video below shows her dancing to her favorite song on the laptop. Finally, Isabella was discharged from the Pediatric unit and back to the rehab center at the Rusk Institute. Since we are waiting on confirmation of the second and third opinions, we've decided to postpone the chemotherapy, so there was no reason for her to be in the Pediatric unit. Plus, she was missing precious rehab time that we could be using to strengthen her right side. Isabella is so glad to be back at Rusk because she was reunited with all the friends that she has made so far. While in Pediatrics, Isabella was very grumpy and would rarely cooperate with anyone which was very frustrating for everyone. She had been there since Friday, when she had the operation to put the port in her chest. Since Friday, Isabella has refused to walk or pretty much do anything until last night, when she finally started to walk around with my assistance. But today, when she went back to Rusk and met up with her friends, she immediately perked up, began smiling, laughing, and dancing. Julianne and I were so relieved because we thought it would take her a few more days to adjust. Her rehab regimen begins again on Thursday, and hopefully, they could make good progress before we start whatever treatment we decide on. By the way, the pathology report from St. Jude should be back by Thursday, which will either confirm whether the tumor is a glioma (original diagnosis by NYU), or an ependymoma (new diagnosis by St. Jude). Either way, we have sent the required material to Johns Hopkins for a third opinion, in case the first two opinions end up not matching. The song that Shira Weinberger used for the Family Photo slideshow is called "Isabella" by the Terrible Twos. You can find it at Amazon by clicking the link and download it for $1.29 or 5 Pepsi points. If you didn't hear the song when you first saw the slideshow, I suggest you go back and watch it again and make sure you have your speakers turned up. It's a perfect song to go along with the slideshow. It has now been three weeks since we first discovered Isabella's brain tumor, and what started out as a whirlwind has slowed to a frustrating crawl. First of all, Isabella has been moved three times in the last three weeks (with one more back to rehab later this week). We already know that she has adjustments issues every time she moves to a new place, but she seemed extra frustrated on this last move from Rehab back to the Pediatric floor after her operation to put the port in her chest. She really has not been making much progress with her right hand, and she hasn't tried to walk since the operation since she's been sore. Not to mention that she's lost a few days of rehab because of the operation. Secondly, the back and forth from Connecticut to New York City is beginning to take its toll. Juliannne and I haven't been together at home for three weeks since one of us has been staying at the hospital every night. We've been eating a lot of New York pizza and cafeteria food. Our parents and in-laws have done a great job keeping things patched together at home, but we feel bad basically neglecting Annalise and Nathaniel. Finally, it's extremely frustrating to still not be sure what this thing is in Isabella's head and not being able to do anything about it. The delays in getting the pathology results and the second/third opinions is really driving us nuts. But although we do wish we could start treatment, we do want to make sure that we are treating the right thing with the proper method. In a way, it could be a good thing that Isabella had the fever that delayed the chemo, because it allowed us to get the second opinion. There is a clinical trial that specifically treats these malignant gliomas in young children, called Head Start (Phase 3). The protocol for this treatment calls for 4-5 cycles of chemotherapy (4 weeks apart), followed by a final week of extremely intensive chemotherapy. That final dose is so severe that Isabella will require a stem cell infusion to assist her recovery since her white blood cell count will end up being very low. If necessary, we will then use radiation to kill any remaining cancer cells. The purpose of this trial is to eliminate or reduce the requirement to use radiation since radiation has several long term side effects affecting intelligence, growth, and motor skills. They need to run some more tests to verify it, which will take a few more days. As such, we will be moving Isabella back to the Rehab center so they can continue with her therapy. Neither diagnosis carries a prognosis that is necessarily better or worse than the other, but this new diagnosis is significant because an ependymoma does not react well to chemotherapy and is instead treated with radiation. Because of this, we will be holding off on chemotherapy for now until we get the final word from St. Jude. Unfortunately, we will now have to go for a third opinion, most likely to Johns Hopkins. Since the neuro-pathologist at St. Jude is a nationally recognized pathologist, we expect the findings to match with St. Jude. You may ask how two pathologists can come up with such varying diagnoses? Well although there are roughly 3400 new brain cancer incidents in children every year, the type that Isabella has is extremely rare with about 50 incidents per year. Because of this, not a lot of people have experience diagnosing it. It's always a special occassion when Annalise comes to visit Isabella in the hospital. Isabella always perks up and has fun with Annalise. Here is a short video of Isabella and Annalise just goofing around while watching a video. We are waiting on a second opinion on the diagnosis from St. Jude's Childrens Research Hospital in Tennessee, which should be in on Monday. In addition, Isabella developed a fever overnight after the surgery, so we decided to postpone the chemotherapy until Monday. Isabella will remain on the Pediatric floor until the chemo is given, then she'll probably be transferred back to the Rusk Institute to continue her therapy. We're hoping for a nice, quiet weekend. The operation to put the port in Isabella's chest was uneventful. Isabella is resting comfortably in the recovery area and we are now just waiting to be transferred to the Pediatric floor. During the surgery, we ran out and bought Isabella some chicken fingers and a hamburger, which she requested before she went under. I'm sure she's going to be starving. Yes, almost 3 hours later, they've finally taken Isabella to the OR. Julianne will be going into the OR with Isabella just until she goes to sleep. Then we will both wait in the recovery room until they're done, which could be an hour later. This picture shows Julianne in an OR gown waiting with Isabella. Of course, Isabella stopped smiling just long enough for me to take the picture. Isabella is scheduled to be taken to surgery at 2PM. They will be placing a port in her chest that will be used to administer the chemotherapy. The whole thing shouldn't take more than an hour or so. The poor thing went to bed early last night, around 8 PM. She isn't allowed to eat anything after midnight, and can only have clear liquids until 10 AM. She's in therapy now, but she's going to be miserable and starving up till the surgery. Here she is in therapy riding a special tricycle. On Friday, Isabella will be going through an operation where they will implant a "port" in her chest. The port is placed right under the skin and is connected to one of her major arteries and is used to administer the medication during her chemotherapy. Since she will be getting treatments over the course of the next 6 months, this eliminates the need to constantly poke her arms with needles. On a bright note, Isabella has started to walk on her own. She started standing with our support a couple of days ago, and would take a few steps if we supported her. But then just last night, we took a longer walk down the hall with her clutching my leg for support. Today at breakfast, we made the same walk, but this time, she just held my hand so she was supporting herself for the most part. Finally, tonight, she was so proud of herself that she started taking steps on her own, and would yell at us if we tried to touch her. Obviously, we're nearby to catch her if she falls since her legs are still weak, but we were really happy to see her walking. She still has to work on her right hand though. She can move her right arm, but her hand remains clenched. We're hoping that therapy will work with her more to make progress. Finally, I apologize for the quality of the pictures. First off, they're taken with my phone camera. Secondly, since Isabella is so elusive towards the camera, I have to play ninja in order to get a picture of her. With Isabella busy in rehab for most of the day all week, I decided to ease my way back into work today and tomorrow. I stayed overnight in the hospital Tuesday night, got Isabella ready on Wednesday, and walked over to the office afterwards. It was probably the easiest commute I've had in years. The plan was to walk back to the hospital at lunch so I can have lunch with Isabella, then head back after work to spend some time before going home. When I got to the hospital, I pleasantly found out that it was "Happy Wednesday", where all the kids on the floor get together in the dayroom and they are served a special lunch. It really is something to see the children get together and the appreciation they display. What's even more amazing are the volunteers that show up day in and day out to attend to the kids out of the goodness of their hearts. 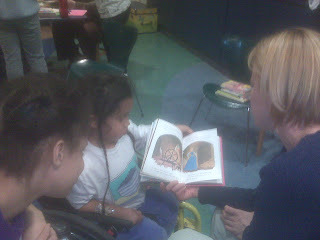 Last night, Isabella had a great time at a story telling session where some people brought in some books and read them to the kids. They even gave a bunch away. Tonight, some volunteers came in to build gingerbread houses and gingerbread men (or women) with the kids. Their efforts are not only inspiring and greatly appreciated, but extremely humbling. I even got caught up in it myself during the Happy Wednesday lunch. Unfortunately, there were more children than volunteers, and some of the children are more needy than others. I tried to help out a little myself, by passing out some of the meals, helping a little girl cut her barbeque chicken, making sure someone had ketchup and just talking with the kids to hopefully let them forget for a few minutes where they were. When I finally walked back to the office, I thought to myself if anything I would ever do at work be as appreciated or as rewarding as assisting these children in need. Many people have asked if they can give anything or do anything to help us out. At this point, there really isn't anything that we need and our family has been assisting us tremendously over the last couple weeks. We would ask that you not send any toys or stuffed animals as we already have a ton of them. The hospital also does not accept flowers or balloons in the children's rehab floor. We may need stuff for long term rehab or for when Isabella comes home, but we won't know that right away. If you still feel that you would like to contribute something, we suggest you look at Making Headway. This organization is not only researching cures for brain tumors, but they also provide a large support network for the victims and families, both during treatment and during recovery. They are partnered with the NYU Medical Center and its Stephen D. Hassenfeld Children's Center for Cancer and Blood Disorders. Isabella had her first full day of rehab today. Up till now, because of the holiday, she had only been getting partial rehab time, and we felt we lost a lot of time because of that. 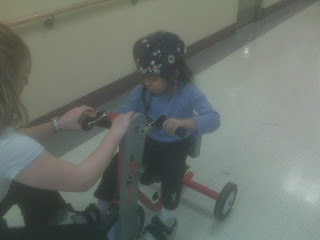 Isabella is still stubborn in using her right hand and in walking and is beginning to get dependent on her wheelchair. She constantly clutches her right hand and we need to get her to open it up and use it more so that she doesn't permanently lose functionality there. She is able to walk a few steps with some assistance, and we need to get her away from the wheelchair so that she can build up strength in her legs. Julianne has been working closely with her and the therapists to properly motivate her to cooperate. We are trying to get as much therapy in as possible before her chemo treatment, because she'll be very weak afterwards, so the more progress we make now, the less we have to make later on. 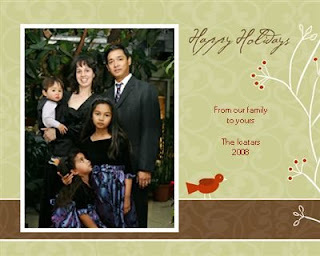 You may have read about our family picture in the blog entry Our Family Picture. We were desperately trying to find a photographer who would be able to come to the hospital and take our picture before Isabella begins her chemotherapy this week. Julianne did a quick search of the area on the Internet and found Shira Weinberger. Julianne told her about our situation and Shira was immediately touched and offered to come down and do a photo shoot at no charge. So on Sunday, we all got dressed up in our Christmas outfits and Shira, who happens to live just a few blocks from the hospital, came down and shot a whole bunch of pictures. And it wasn't easy! Isabella decided to be at her grumpiest, and frankly, I was just about to give up on the whole idea. But somehow after 20 minutes or so, Shira was able to get Isabella to relax so we can get some good pictures. We can't thank Shira enough for her incredible generosity and patience. Please visit her website at shiraweinberger.com and drop her a message to thank her for her amazing display of compassion. It's difficult to think positively when up till now, we've pretty much gotten the worst news at each stage. We went from thinking benign tumor to malignant tumor. We thought the tumor had been completely removed, only to find out that it had infiltrated the brain stem. We went from thinking it was a slow growing tumor to finding that there are some fast growing cells as well. At this rate, I don't even want to think about some of the cure and remission rates that we've found, or some of the really bad side effects from the chemotherapy. Isabella was hours away from herniating her brain stem and dying. We were extremely lucky to have gotten Isabella to NYU when we did and have the right people available to work on her. The tumor was massive and completely replaced her left temporal lobe (10cm by 7 cm). The doctors said that they have seen tumors half this size that permanently wiped out a lot of functionality. Amazingly, Isabella's brain rewired itself and made new connections to work around the tumor. Aside from the loss of her right hand and leg, she is the same Isabella! She's just as smart, and fun and goofy and grumpy. With any brain surgery, there is always a chance of altering personalities or permanently losing some physical skills. Her right side continues to improve on a day by day basis. She can move her right arm and stand up and walk with some assistance. When in the "right mood", she'll do things with her right hand, and we expect her to be able to use her right fingers with more therapy. We thought that they would need to cut off all her hair for the surgery, but instead, they only had to shave a small strip for the incision. This is going to allow us to take a formal family picture with most of her hair before she goes to chemotherapy. The support that we've received from family and friends have been nothing short of amazing and uplifting. It's been such an emotional roller coaster that it's hard to enjoy the positives only to know that a negative can be lurking right around the corner. But we have to hold on to these positives and use them to help us through the negatives. Julianne, her dad, Annalise and Nathaniel came down to the hospital so that we can all spend Thanksgiving together. The rehab floor had a ton of food with a traditional Thanksgiving dinner. As soon as Isabella saw Annalise and Nathaniel, she immediately lit up and couldn't stop smiling (except of course when we took pictures of her!) We played, ate, and laughed. For the first time in over a week, our family was together and even though we were in the hospital, we felt normal. And you can definitely tell the difference with Isabella. She wasn't cranky and didn't complain with her therapy. Annalise even accompanied her to one of her therapy sessions and Isabella loved having her sister around. Here are some pictures from our day. 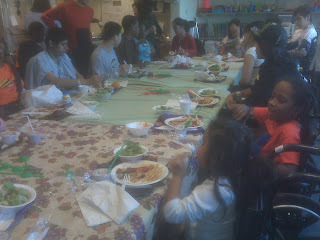 All the kids on the Pediatric Rehab floor gather around the table in the playroom for Thanksgiving dinner. Isabella loved having her sister around and could not stop smiling as they played all afternoon. Nathaniel apparently thought that the foot rests on Isabella's wheelchair were made just for him. No matter where Isabella was, Nathaniel would try to sit or stand on the footrests. Here, Isabella tries to eat at the table, but Nathaniel goes ahead and grabs a seat. Now that it is officially Thanksgiving, I'd like to thank everyone for the tremendous support and outpouring of thoughts and prayers we received. This has been and will continue to be the most trying times of our lives and we'd never be able to get through it without you. In particular, we'd like to thank my mom and Julianne's parents who have helped around the house while Julianne and I stay with Isabella in the hospital. We'd also like to thank my brother, EJ, and Julianne's brother and his wife, Mark and Beth who have stopped by to help around the house. Thanksgiving for us will be very different this year. Normally, we gather at a relative's house and eat all day until we pass out. This year, we will be spending Thanksgiving in the Rusk Institute with a bunch of other families in similar situations. It will be different, and difficult, but at least we will be together. I am confident that we are giving Isabella the best treatment possible and giving her the best chance of beating this. I am hopeful that come next Thanksgiving, I will have many more things to be thankful for, especially celebrating Isabella's health at home. Isabella is beginning to adjust to her new surroundings in rehab. She started out cranky at having to move to yet another location, by not cooperating with the therapists. Finally in the afternoon, she began to adjust and started participating in activities. She got a little cranky late in the day, but that could be because she didn't get a lot of sleep being in a new place and all. Julianne and I met with the oncologist, who will be treating Isabella. Although they still don't have the final pathology, they show a number of different cancer cells in her tumor, with some of them being aggressive gliomas. This was pretty much our worst nightmare. We hope to start an aggressive chemotherapy treatment within the next week or two that will last 5 cycles over the course of the next 5-6 months. Over that time, we will have several MRI's taken to track how well what's left of the tumor is reacting to the chemo and hopefully, at the end of the cycles, there will be nothing left. We know that the prognosis for malignant gliomas are generally not good, but the oncologist pointed out to us that they are still treating this to cure the cancer and not just prolong the inevitable. The next several months are going to be very difficult for us. Please keep us in your thoughts and prayers. 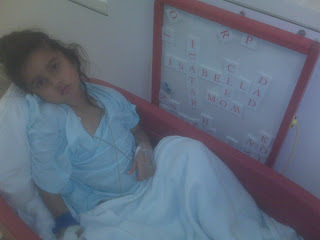 Isabella was just discharged from the Pediatric floor and is in inpatient rehab in the Rusk building. This building is adjoining the Tisch building where we were staying. The rehab regimen here sounds pretty intense and very structured. They have set times for when they will do physical therapy, occupational therapy, and if necessary, speech therapy. Although to be honest, she's been talking fine. They also have teachers from the Board of Ed to keep the brain sharp. They have stuff scheduled from 9 until 4. Isabella has continued to improve. She can now pick up a chicken nugget with her right hand and feed herself. Although it takes a litlle effort, she couldn't even move her arm a week ago. Everyone here is still amazed at the progress she's making. One nurse commented that she has never seen someone recover so quickly in her 17 years! Wait till the teachers find out she can already read! It is now just past 5:30 PM on Monday, November 24. 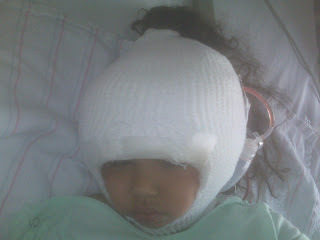 Exactly one week ago, our lives were thrown for a giant loop when we found a massive tumor in Isabella's head. It seems like a million years ago, and yet, it seems just like yesterday. We've had more ups and downs than a roller coaster, but right now, we seem to be cruising right along. Physically, Isabella's recovery has been amazing. She's been eating and drinking great and been talking a chatting up a storm. Her right arm and leg are still weak, but she can move them a little and she can wiggle her fingers and toes which is a great sign. Unfortunately, Isabella is stubborn for the physical therapist who tried to work with her which could delay her full recovery. Surprisingly, when the pediatric rehab physician stopped by, Isabella was able to raise her right arm straight above her head and stretch out her fingers (even though she says it hurt a little). She was also able to stretch out her right leg and earlier took a few steps on her own. As far as what's left of the tumor, we still have not heard back the pathology results. So we're still in limbo as far as that is concerned. But as the doctor suggested, there's no need to worry now, but what we do know is that Isabella is getting back to her normal self. And that in itself is enough to make us smile. Over this past weekend, Isabella has made some incredible progress physically. Immediately after the surgery, she wasn't able to move her right arm or right leg at all, although she could wiggle her fingers and toes a little with some effort. But over the last couple days, Isabella has been moving her right arm and leg and stretching out her fingers. She's still favoring her left side heavily, but we're trying to encourage her to use her right side to build strength. She has also been drinking and eating very well which will contribute to her growing strength. Just tonight, I was talking in the hallway with another parent. When I looked over at her bed, I noticed that Isabella had climbed out of bed on her own and took a couple steps towards me. Her right leg finally gave out because it was so weak and she fell on her bottom, but we were both extremely excited that she had tried to walk. Her smile was from ear to ear! It turns out that Isabella had to go to the bathroom, which is why she got out of bed, so I guess we just have to find the proper motiviation for her! We just made an amazing discovery with Isabella. We found that if we take her out of her room, she immediately perks up! The Pediatric department provides some red wagons, and we put her in one and just took a stroll around the floor. Isabella immediately cheered up and began playing "I Spy" with me. 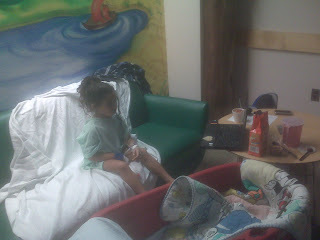 We then went over to a lounge area where Isabella sat up and spoke and even smiled a little. We knew she had grown frustrated sitting in her bed, but we didn't know that just taking her out of her bed would have such a positive impact. We must have walked around that floor a dozen times so it was getting more difficult finding new things to "spy". At one point, I asked Isabella how many times she wanted to walk around. She held up both hands to indicate 10 times. Keep in mind that before this, she had not used her right hand since the surgery. In the picture below, we came across a magnetic board with a bunch of letters. She helped me spell out a bunch of words, but as you can see, we had to get creative as we ran out of some common letters. You can also notice that they finally took the big bandage around her head. Amazingly, they only had to shave a strip of hair from her head where they made the incision. Isabella had some visitors stop by, first it was my mom and EJ, then it was Julianne's mom and Annalise. Isabella didn't do well with either visits as she just sat in her bed and moped. We at least thought that seeing her older sister would cheer her up, but that didn't work either, as they just sat in bed and watched TV. It must be very difficult for Isabella, who has grown extremely frustrated with where she is. She has a bunch of IVs in her and tubes running everywhere, plus she has to constantly take all sorts of yucky tasting medicine. We're trying to keep our spirits up as best as we can, but as some of you may know, Isabella is strong headed - if she doesn't want to do something, she will not do it. We're hoping that this is just part of an adjustment period and hopefully, she'll liven up soon. We were hoping that the followup MRI would show what we had hoped: the Dr. Wisoff had extracted all of the brain tumor from Isabella and we would be done with all this. When we reviewed the MRI with Dr. Wisoff, he gave us the good news that Isabella's brain was already shifting back to normal and that there was no additional swelling or immediate cause for concern. Unfortunately, he saw some areas where he believed the tumor had infiltrated Isabella's brain stem that needed further testing. Dr. Wisoff initially thought that the malignant tumor was either a PNET or a glioma. Neither have a very good prognosis, but the PNET can be treated using chemotherapy with success rates from 60 to 80%. On the other hand, a glioma may or may not be treatable and the patient usually only lives for another year or so. Initial tests on the tumor ruled out a PNET, which caused our hopes to sink even more. Dr. Wisoff suggested that we not worry about it until we know for sure, but it's extremely difficult to function knowing how dire the outlook is. I guess the best we can do is savor every minute we have and still hope for the best. They say that children recover amazingly well from surgery compared to adults. We were fully expecting Isabella to be intubated for a few days and for her to be incoherent at best for a few days. But amazingly, Isabella came back from surgery not intubated, and she was pretty lucid the next morning, albeit a bit groggy. The giant bandage around her head looked like a big helmet, with her hair coming out from the top. The day was pretty quite as Isabella rested in her bed. The only thing we had scheduled was the followup MRI, which we finally did later in the afternoon. Julianne had gone home to see Annalise and Nathaniel, so I was left to be with Isabella while they took her MRI. Isabella slept through the MRI, which was good so that they wouldn't have to sedate her further to keep still, and she slept most of the day. But sometime in the middle of the night, she woke up and said she was very thirsty. She had been on IV's since she came out of surgery, so this was a big step. Then she said she was hungry and ate a few crackers. We finally got to sleep pretty late on Wednesday night, but all in all, it was a pretty good day. Dr. Wisoff said the operation should take about 3 hours, and that no news was good news. We ran out and got a quick bite to eat at a local diner. We had left our cell phone numbers in case we needed to run back right away. I'm glad we didn't get any calls, because I know we would have freaked if either of our phones rang. We picked at our meals and tried to eat, but neither of us had much of an apettite. It was a cold night and we walked back quickly to the hospital. We got back and waited in the Pediatric ICU where they would be bringing Isabella after the surgery. 12:30 AM came and went with no word from the O.R. Again, no news was good news. At 1:30 AM, we began to get a little nervous. If Dr. Wisoff was as good as we hoped he was, we figured he was a perfectionist and was making sure he was getting everything. But of course, there was always that feeling of dread in the back of our heads. Finally, at 2:30 AM, Dr. Wisoff briskly came into the room and announced that he was done. He said that he had gotten everything that he could see and was extremely pleased with the outcome. A huge wave of relief swept over Julianne and me and we thanked him profusely. They were going to close Isabella up and bring her up as soon as they were done. She would have a follow up MRI the following afternoon just to make sure they got everything and that her brain was shifting back in place. Around 4:00 AM, they finally wheeled Isabella into her room. She had a giant bandage covering her entire, but amazingly, she still had most of her hair. We were never so happy at that moment to see her come through the surgery. In the Pediatric ICU, there is only room for one parent to sleep bedside with the child, so Julianne stayed. I went to the parents lounge, where I finally got to sleep around 5:00 AM. 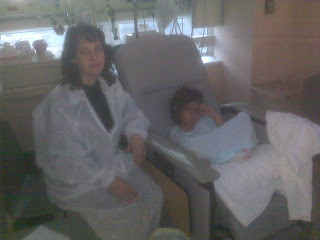 By the time I got to NYU at around 7:00 PM, Julianne and Isabella were already in the MRI area. The Physicians Assistant, Kristen, was extremely friendly and helpful and made us feel as comfortable as we possibly could. In addition, the pediatric neuro-anesthesiologist, Dr. Max, was prepping Isabella for the MRI. Dr. Max was instrumental in saving Isabella because he personally ran up to the Operating Room where Dr. Wisoff was in the middle of another procedure and told him that he needed to do Isabella right after his current operation. Dr. Max felt that based on Isabella's current condition, she was close to herniating her brain stem. Brain stem herniation is when the brain stem separates from the rest of the brain because of swelling or pressure from a tumor and is fatal. Around 9 PM, we finally met Dr. Wisoff. The MRI had already confirmed that the brain stem had already shifted due to the growth of the tumor. He also felt that the tumor was malignant, meaning it had penetrated good brain tissue. He would be able to remove most of the tumor, but he wouldn't be able to remove any that had penetrated - that would need to treated with either radiation or chemotherapy or both, depending on the type of tumor. Our hearts immediately sank, because up till now, we were hoping that it was a benign tumor that was completely separate from the rest of the brain and could be completely removed. Obviously, the prognosis for a malignant tumor is far more dire than a benign tumor, but at this point, the priority was to remove the bulk of the tumor. We walked with Dr. Max as he wheeled Isabella up to the Operating Room. Dr. Wisoff estimated the operation to take about 3 hours. Dr. Max reminded us to give Isabella a kiss, then we watched them wheel her through the O.R. doors. It was 9:30 PM. 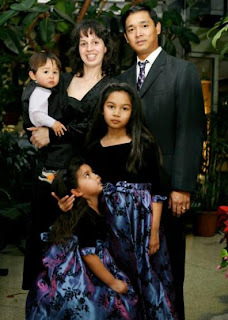 We took our last formal family picture more than three years ago, before Nathaniel was born. Because I'm usually behind the camera, we have very few pictures of all of us in the same shot. The last one we have is from Nathaniel's 1st birthday back in August. We had an appointment to take a formal portrait this Saturday, November 22. Julianne had found a perfect set of dresses for the girls and a matching suit for Nathaniel. She made me get a haircut exactly 2 weeks ago so that my hair would be the perfect length for the picture. It was apparent that we wouldn't be able to make our family portrait appointment on Saturday, so we were hoping to maybe take a quick snapshot with our digital camera before they operated on Isabella. We were fully expecting them to shave her head, so we wanted to take this opportunity to take a picture with her beautiful hair intact. As we were preparing to transport Isabella down to NYU so we can treat the tumor in her head, I was putting together a list of items to pick up from home. As Julianne was riding with Isabella in the ambulance, I would pick up the kids at home (my mom and Julianne's mom, who had just come down from Vermont, were watching the kids), pick up all our clothes, and bring everything down to NYU. Hopefully, by the time they got to NYU, Isabella would be lucid enough so that we could take a picture. Unfortunately, I got a call from Julianne around 5:00 PM after they arrived at NYU. 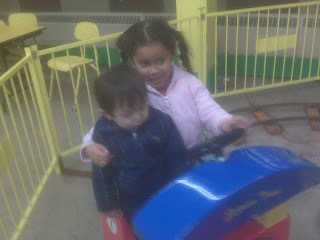 Isabella did not get any better on the ride down, and in fact vomited more and seemed to be getting worse. There was no way we would be able to take a picture. Instead, I gathered some overnight essentials for us, left the kids at home with the grandmas and headed straight for NYU. The medical staff there was extremely concerned about Isabella's condition and was considering operating on her that night. 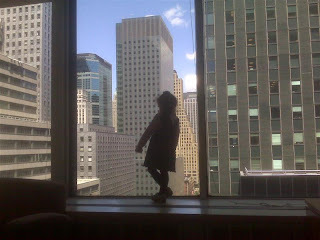 Back in May, I brought Isabella into work with me to New York City. She loved taking the train in and loved staring out the window of my office to count all the yellow taxis. While she was in her delirious state on Monday night, she said to me in a slurred sentence, "I want to go to New York City with you". Ironically, Isabella would get her wish. Julianne rode down with Isabella in the ambulance from Bridgeport to NYU. The EMTs brought medicine along just in case she seized. They wouldn't be riding with the lights on, but would do so if necessary, and would also stop at a hospital along the way if they had to. Aside from some more vomiting, Julianne and Isabella got to NYU at 4:30. I got Annalise on the school bus at 8 AM on Tuesday. My mom and brother had come over late on Monday night after hearing the news and they would watch Nathaniel while I went back to the hospital. I gathered some stuff for Julianne since she hadn't been home since Monday morning. All the doctors in the Pediatric ICU were having a meeting on Tuesday morning to discuss how Isabella should be treated and I wanted to be there for it. When I got to the hospital at 9:30, Isabella was knocked out since she was up and agitated until 6:30. Julianne told me about one of the best neurosurgeons in the country at Yale, but he apparently wasn't available until later in the week. She also received another call from one of her colleagues of a Dr. Jeff Wisoff at New York University who is also one of the best pediatric neurosurgeons in the country. We felt more and more that we had to take Isabella to Yale or NYU, and not just for the neurosurgeon, but because those places had additional dedicated, specialized staff. For example, while Bridgeport has a general anesthesiologist, Yale and NYU would have pediatric anesthesiologists. We finally met with Dr. Lipow at around 11:00 AM. He agreed that it would be best to transfer Isabella and suggested NYU where he knew Dr. Wisoff. This was quite a relief as we weren't quite sure how to approach the Bridgeport staff to say that we wanted to transfer. We also thought it was fate since she received the call about Dr. Wisoff just minutes before we met with Dr. Lipow. The Bridgeport nurses contacted NYU and Dr. Wisoff and they agreed to accept Isabella that day. They arranged for a transport team and an ambulance to come from New York to bring Isabella to NYU. Throughout all this, Isabella remained fast asleep. We suspected it was due to being up all night. However, just before the EMT's arrived to bring Isabella down, she began to vomit. We didn't know it at the time, but Isabella was rapidly growing worse. We also didn't know it at the time, but our decision to send Isabella down to NYU saved her life. 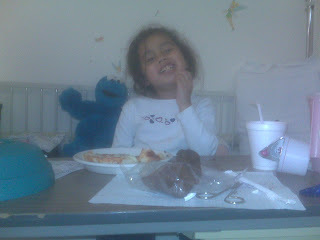 After the MRI, we brought Isabella up to the Pediatric ICU at Bridgeport Hospital. In addition to the sedative, they had given her a steroid to decrease the swelling and pressure in her head. The drugs that they had given her had caused her to become delirious and agitated. The doctors had wanted to get a second MRI so they can better determine how best to remove the tumor, but unfortunately, Isabella would not be able to lay still long enough. So the plan was to continue the steroid pressure to relieve the pressure and do a second MRI in the morning. In the meantime, we were already making calls all over for referrals (by this time, it was 8 PM or so). We wanted the best treatment for Isabella and felt we had to go somewhere else, perhaps Yale or somewhere in New York City. Julianne's mom called people up at the University of Vermont where she works and where Julianne graduated from Med School. Julianne also called her boss to get some referrals from the Yale. In addition, the word was already going around the hospital on our situation, and since Julianne worked in the hospital, she was receiving calls from other doctors. Julianne stayed with Isabella overnight, while I went home with Annalise and Nathaniel to get ready for the next day. Isabella had a long night of delirious visions and she said she saw everything from her classmates to Santa Claus. She finally fell asleep at 6:30 AM on Tuesday. At around 5:30 PM, on Monday, November 17, our lives changed drastically and forever. I was sitting in the Emergency Room of Bridgeport Hospital. A doctor whose name I can't remember came into the room where I was waiting with Annalise and Nathaniel and said, "They found a mass in her brain." It was like somebody punched me in the stomach. The doctor continued to talk, but I didn't hear a thing. Inside my little Isabella's head, there was a tumor growing and if left there, would kill her. Up in the MRI room, Julianne was sitting with Isabella. We had already suspected that it was neurological in nature. As the MRI scan ran, Julianne comforted Isabella as she lay in the giant machine that was making loud noises. Julianne peeked over at the technicians sitting behind the glass and was immediately devastated by what she saw. As the images of Isabella's head came into view, looks of horror ran across every one of their faces. Julianne herself would not look at the images, but she knew this wasn't good. The MRI scan found a massive tumor in Isabella's head. It was 10 cm x 7 cm and had replaced her entire left temporal lobe. It had already begun to affect her, as she had been complaining of headaches and just over the weekend, we noticed tremors in her right hand. The tremors affected her so much, that Isabella had started using her left hand for her primary activity including writing and eating. The remainder of this blog will describe what happened over the course of the next days as our family now deals with the worst scenario that we can imagine. I got up early and was at work by 7:30 on Monday so I can get a headstart to the day. But I couldn't get anything done, as I had this bad feeling about Isabella. I googled children, headaches and tremors and none of the hits brought up anything good. Julianne called me shortly after she dropped the kids off at school. She talked with Isabella's teacher who did mention that she just noticed some strange behavior from Isabella just on Friday. Mrs. Stelly brought out some of Isabella's writing samples and up till last week, her handwriting was typical. But on Friday, you could see a noticable change in her handwriting as it was much lighter and much shakier. Mrs. Stelly thought nothing of it at the time, because she thought Isabella may have been sick. She even mentioned that Isabella had been swinging on the monkey bars earlier in the week. 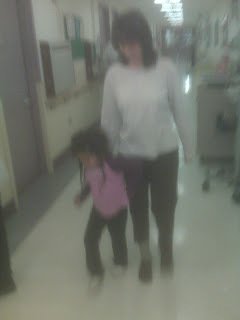 At 9:30, Mrs. Stelly called Julianne because Isabella complained of a headache and had started to walk funny. We had an appointment with the pediatrician at 1 PM, but Julianne wanted to get her in right away. She gave me a call to update me from the doctors office. The doctors suggested that we immediately go to the Emergency Room to have an MRI done. Julianne took Isabella up to Bridgeport Hospital. I made plans to jump on the next train home to pick up Annalise so we can meet up with them in Bridgeport. When we all finally met up in the Bridgeport E.R., you would never had guessed that Isabella was sick. She was running around with her brother and sister, laughing, and playing. At around 3:30, they came by to give Isabella a small sedative so that she would sit still for the MRI. We even played a game to see who could sit still the longest. At around 4:15, they came by and said they were ready to take her up to the MRI. Isabella had calmed down just a bit from the sedative and Julianne said that she should carry her. "I'm not even tired," Isabella said, as she stumbled off the bed and wobbled toward the door, eyes half-way shut. Julianne carried Isabella out of the room up to the MRI room, and all Annalise, Nathaniel, and I could do was wait.